Queens Stainless Steel Easy-to-Use Cutlery Utensils. The Queens Cutlery range of cutlery is a very popular range of food utensils combining quality stainless steel utensils with lightweight built up plastic handles. 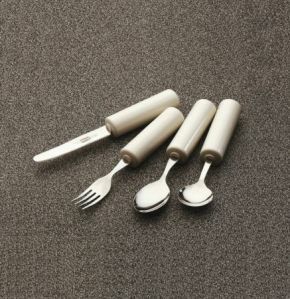 They provide an excellent eating solution for those with a weak or painful grip that otherwise have difficulties using traditional cutlery. The Queens range of utensils have cylindrical handles that help when gripping. Each utensil is hygienically sealed - this means that where the handle joins the metal, the tool is fully sealed - no gaps where dirt or bacteria can collect! Easy to clean and dishwasher safe. Weight wise and ease of use very good, but dont put them in the dishwasher, they fill up with water. It then takes days to dry them.